Posted June 2, 2014, in Exhibitions, Past Exhibitions. For the names of the singers, go to Victor Book of the Opera page 4. 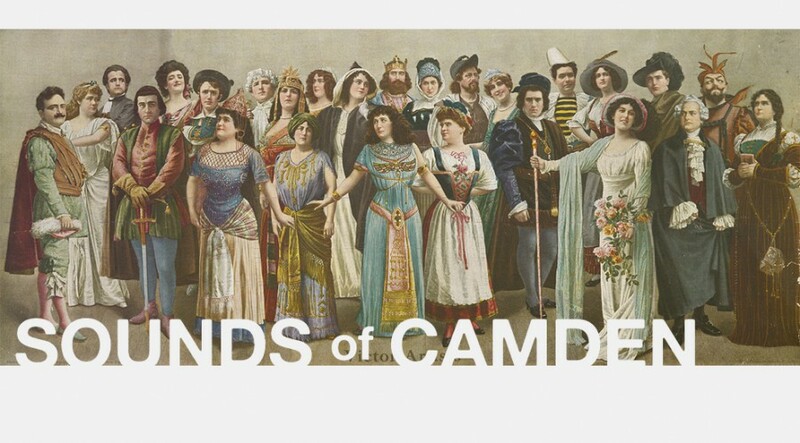 This exhibition will also present live performances and recordings that carry historical and contemporary Sounds of Camden: music, poetry, recorded oral history. Musician Mark Zaki has composed a contemporary electro—acoustic music work titled Camden Rounds integrating ambient sounds of Camden, such as the Riverline and PATCO that will play continuously in the Stedman Gallery. Joe Schiavo, Artistic Director of the Mallery Concert Series, has developed a fall season’s programming of recitals with a Camden connection. Recitals will be held in the Mallery Room, Fine Arts Building 224 at 12:15 pm on the following Wednesdays: October 1, 8, 15, 22, 29, November 5, 12, 19 and December 3. 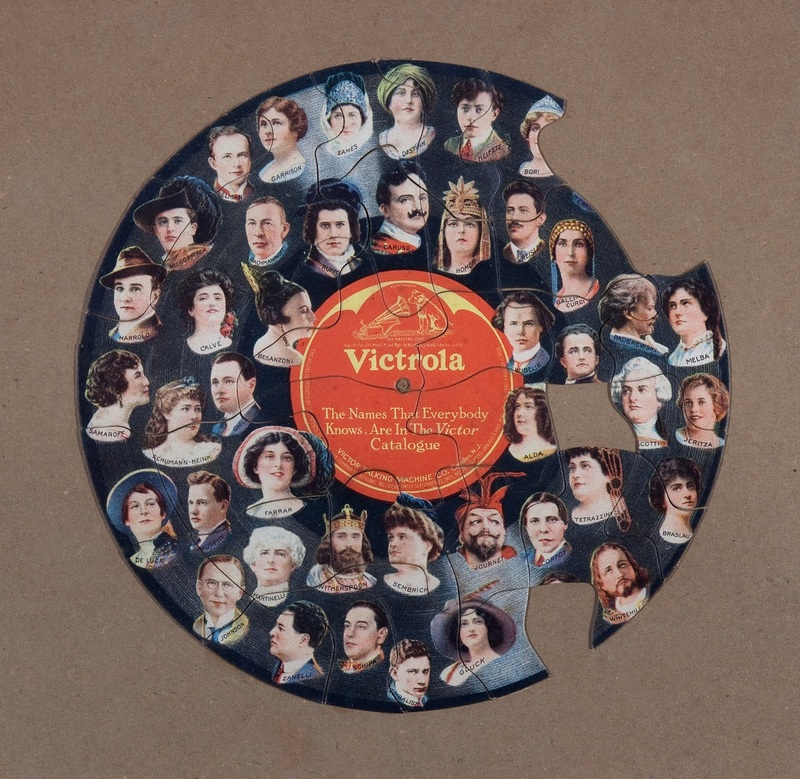 Gordon Theater sound technician Stefan Arnärson is developing 4 listening stations for visitors to sample classical and popular recordings produced in Camden by RCA Victor, voices of Camden, and recordings of and by Walt Whitman. Miranda Powell is overseeing a studio for visitors to record their experiences and memories of Camden. This recording booth will be open to the public. Call Miranda Powell at 856-225-6202 for more information and to reserve a recording time. Sculptor Elizabeth Demaray is recording humans imitating bird songs, a piece titled “The Songs We Sing Camden,” drawing attention to the demise of bird populations. The recordings will be played in random sites across campus, both indoors and out. Theater director Ken Elliott has written “Hand Me Down the Silver Trumpet,” a musical review of recordings from the RCA Victor songbook from the 1920s and 1930s by African-American artists, featuring Dionne Fields. The review will be held in the Gordon Theater at 7:30 pm Friday October 17 and Saturday October 18; a 2 pm Sunday matinee October 19, and a performance for high schools 10 am Thursday October 16. Tyler Hoffman, who has a broad interest in the spoken word, has curated live and recorded performances of writing and poetry, including that of Camden residents Walt Whitman and Nick Virgilio. Whitman recordings will be accompanied by Robert E. Emmons collection of Walt Whitman memorabilia. Tyler Hoffman and RCCA associate director Noreen Scott-Garrity are organizing a reading of Walt Whitman’s 52 part Song of Myself in the Stedman Gallery at 4 pm on Thursday November 13. Contact Noreen Scott-Garrity at 856-225-6306 if you wish to participate. In addition, the Walt Whitman House, located at 330 Mickle Boulevard (also known as Martin Luther King Jr. Boulevard) in Camden, will be open for guided tours earlier that same day, at 12:30pm. All readers and audience members are welcome, but please reserve your spot at 856.964-5383, as tours are limited in size. Constructed in 1848, this modest wooden-framed structure built in Greek-revival style was the only home ever owned by Walt Whitman. Here is where Whitman grew to international fame as the author of Leaves of Grass, hosted visitors from around the world and completed his last comprehensive volume of poetry before his death in 1892. Symphony in C has programmed Brahm’s Hungarian Dances 5 & 6 recorded by the Philadelphia Philharmonic orchestra in RCA studios in 1917 for its November 1 concert to be performed in the Gordon Theater. Music Director Rossen Milanov will share his thoughts on the importance of recorded music in the City of Camden. The public is invited to attend the dress rehearsal to be held in the Gordon at 7:30 pm. on October 29, preceded by a reception at 7 pm.. This is a free event but please call to reserve your place. The Stedman Gallery will be presenting in-house performances of Camden-related music, poetry and readings for small groups. Please call Nancy Maguire at 856-225-6245 if you would like to join the roster. This page was printed from http://rcca.camden.rutgers.edu/2014/06/02/sounds-of-camden/ at 5:53 AM Friday, April 26, 2019.